Originally published on Medium - featured on UXDesign.cc, Sidebar.io, and other UX design blogs. Amazon is my go-to place for discovering, researching, and buying the majority of all my products. One thing I love is being able to use my favorite service on the go with the Amazon mobile app. 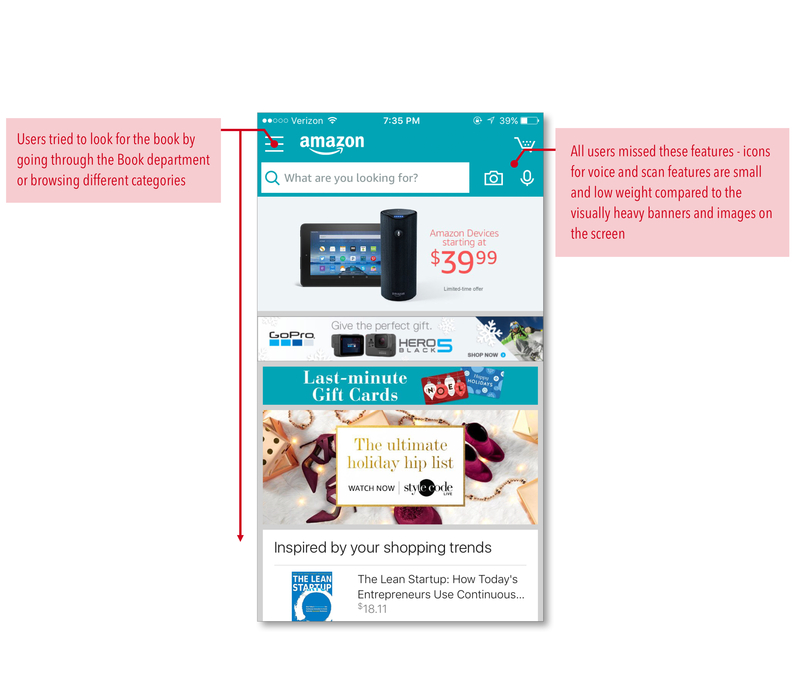 Recently, while shopping for some products at a store, I discovered a feature on the mobile app that I didn’t even know existed — the scan feature. It is more powerful than your basic barcode scanner as it can recognize shapes and objects and surface the exact item in the mobile app, or find something very similar to the item you were looking for. 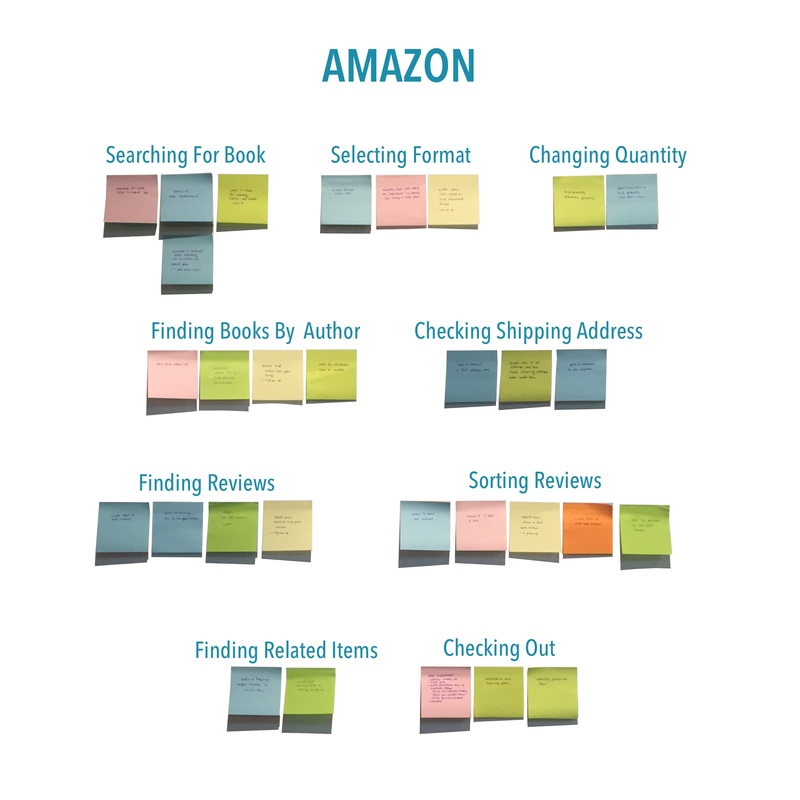 I was really excited to find this feature because it made product research and comparison an absolute breeze when shopping for products in stores. I did wonder, however, why it had taken me so long to discover the feature in the first place. When had other users figured out the scan feature? Was it just hard to find? Was it possible that there were other features in the app that I wasn’t aware of? To test the user experience, I asked 7 people to go through a series of pre-defined tasks on the mobile app as I recorded their actions and took notes on anything they said or did during the usability test. 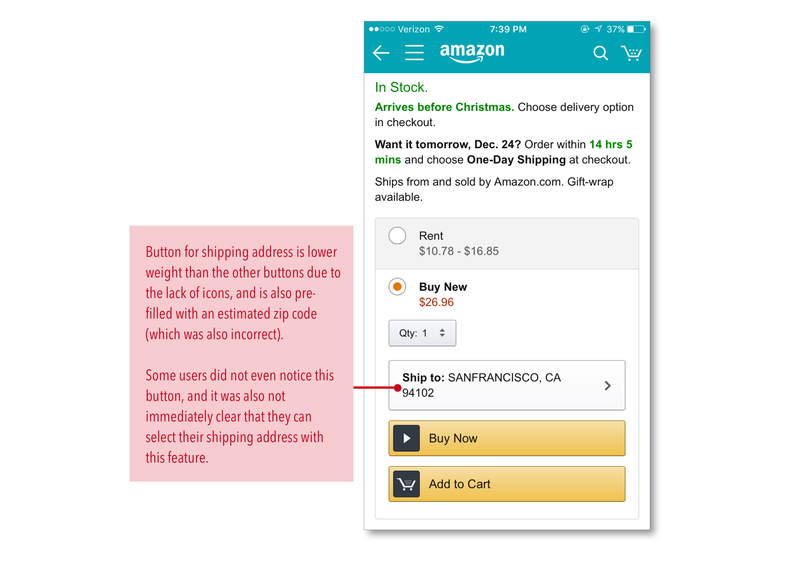 All of the users had previous experience with shopping on Amazon on desktop, but had little to no experience with the mobile app. I brought a physical book with me to make the experience more realistic, and also to provide users with several ways to search for the book (search bar, scan, voice, etc.). 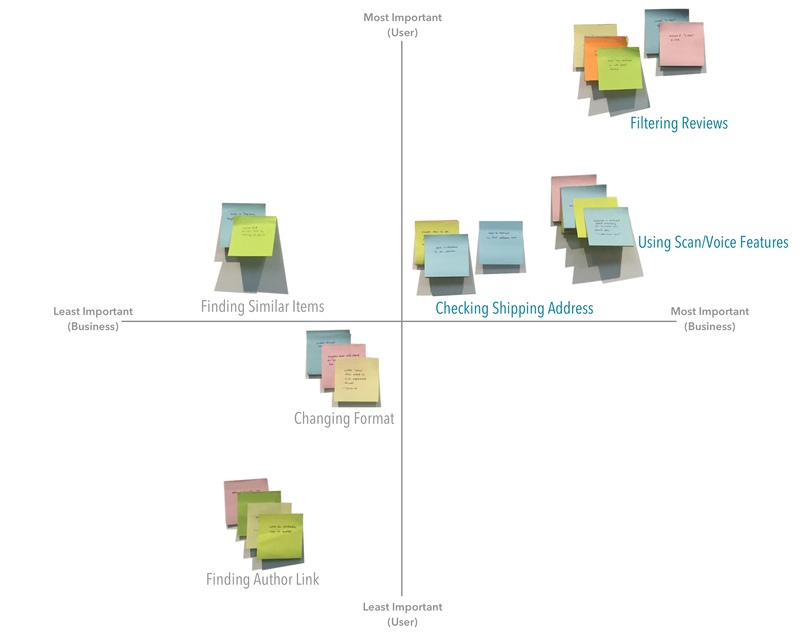 Since this was a personal project, I took it upon myself to determine which would be the top design problems to tackle based on potential impact to business goals and user needs. Reading reviews are a key part of the online shopping process — a quick Google search shows that 77% of customers read online reviews before making a purchase. 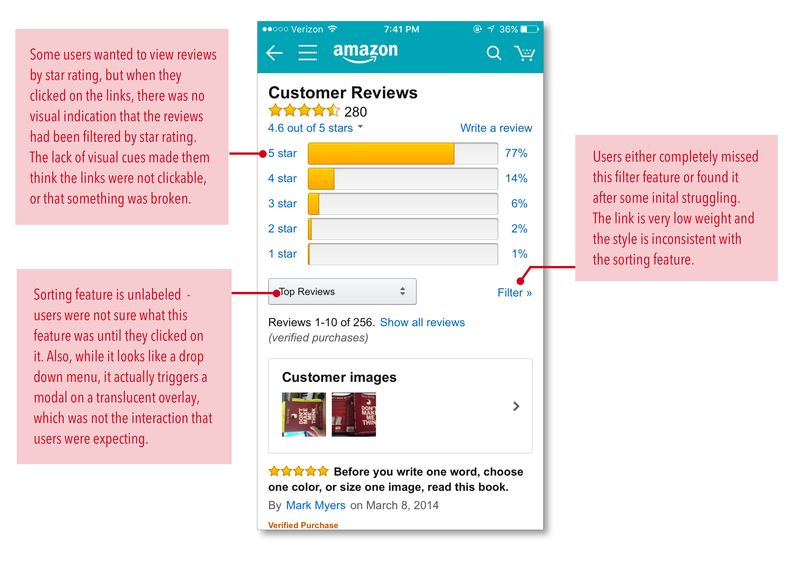 Yet in the Amazon app, users were confused about how to sort or filter reviews due to the lack of visual cues in the current UI, and were often unable to find these features. The app has a button to check the shipping address right on the product page. However, some users didn’t even noticed the button and instead used their account settings or went halfway through the checkout process to check their shipping address. When asked to find the book using a method other than the search bar, none of the users noticed the scan or voice buttons in the top navigation. Instead, they all proceeded to look in different departments and categories. After identifying and prioritizing pain points, I created a provisional persona to help me create solutions for a specific type of user. 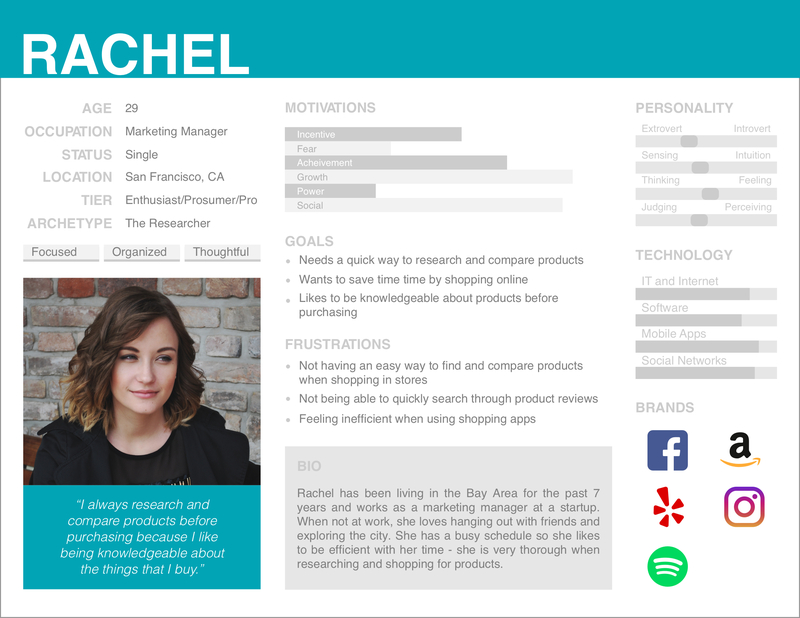 This persona was roughly based on users that I talked to during the usability testing, and if I had more time, I would strengthen this persona with additional user interviews and research. I sketched out some rough ideas on paper to ideate some possible solutions for the top pain points before diving into high-fidelity mockups — using low-fidelity wireframes allowed me to explore several different ideas instead of spending too much time on a single idea. Solution: Reducing the friction for sorting and filtering reviews would help users make quicker decisions about the item and increase the purchase conversion rate. 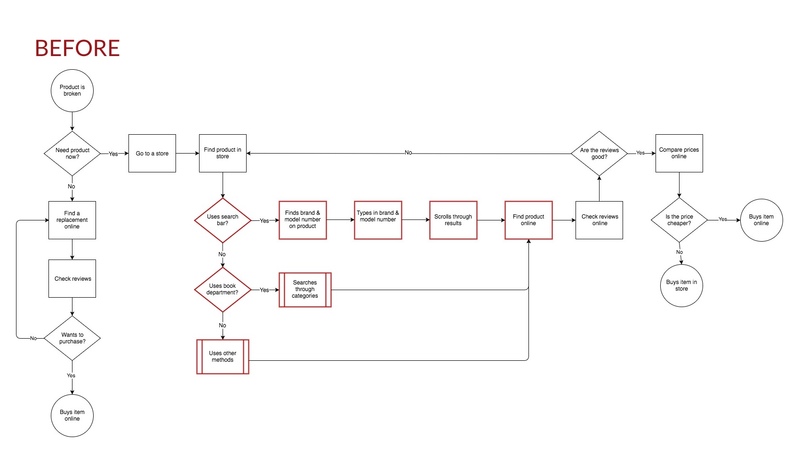 Solution: Providing users with an easy way to check and select their shipping address on the product page would allow them to skip a step in the checkout flow and speed up the checkout process. Solution: Increasing discoverability for the voice or scan features could potentially increase online sales from users who want to research and compare products when shopping in stores. 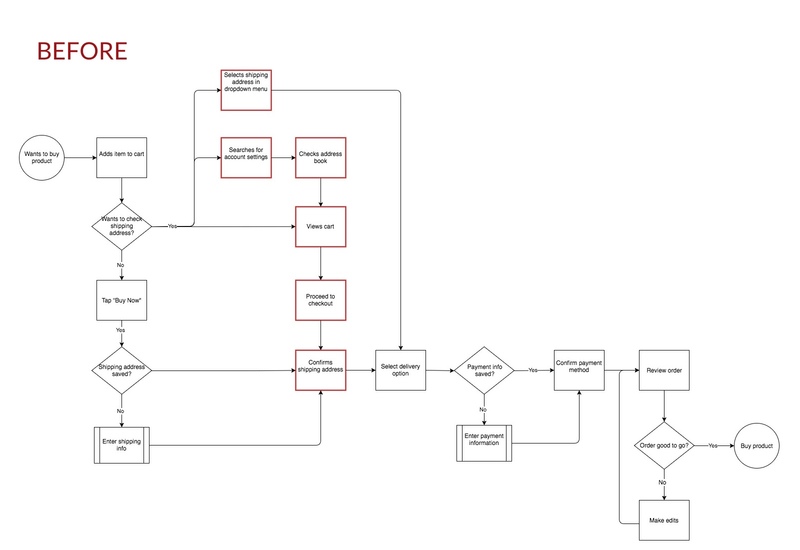 Using the high-fidelity mockups, I used Marvel to create an interactive prototype for validation testing. 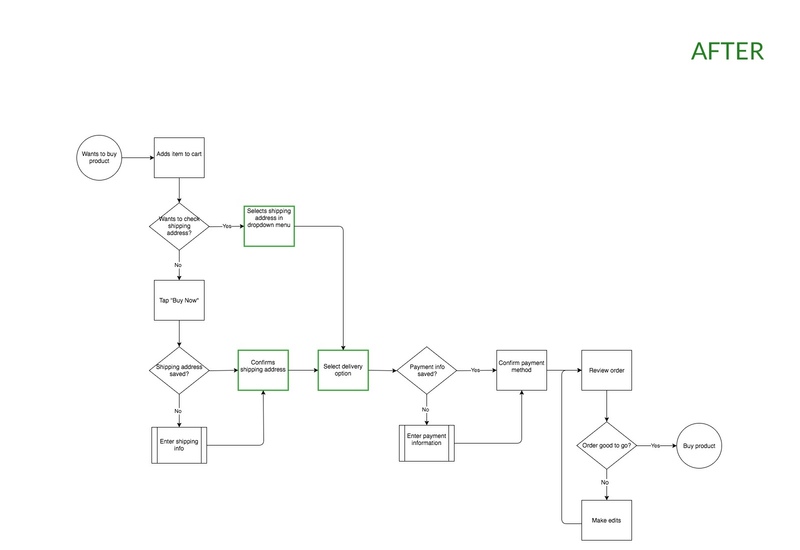 After creating the prototype, I tested my solutions using the same usability test questions from my initial tests. I also targeted people with a similar background to my initial users — all of them have used Amazon on their computers, but had little to no experience on the mobile app. Through some quick guerrilla usability testing, I found several issues with filtering and sorting reviews, checking shipping address, and discovering the scan and voice features in the app. 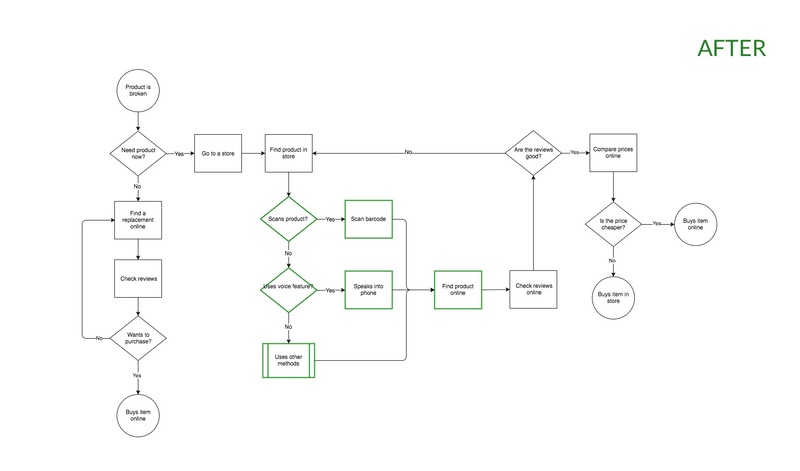 Based on the results of the tests, I redesigned these features and validated my design decisions with follow-up usability tests on a high-fidelity, clickable prototype. Though the results from validation testing are qualitative, they show that even small changes to the app can increase discoverability and usability of important features. This case study was a great opportunity for me to explore ways of improving one of my favorite apps, and through the process, I was able to flex my design skills by creating a solution from beginning to end.